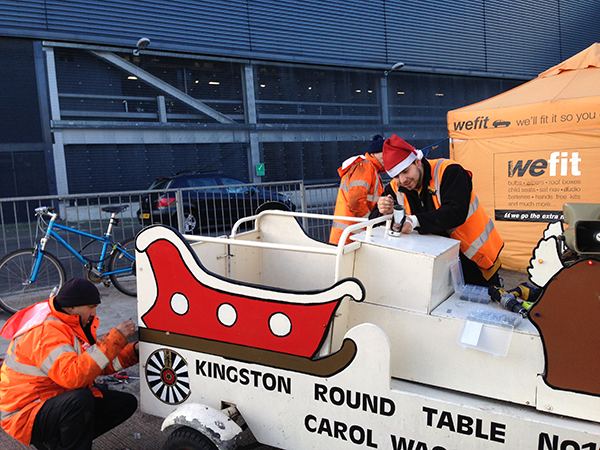 Our annual fundraising Carol Wagon proved to be a massive success. Over the course of five nights at the beginning of last December we raised an astonishing £2,355.05 in direct donations! When supplemented by a generous gift from our friends at Kingston Rotary brings the total to £2500. This year's recipient of the funds will be the fantastic initiative Love Kingston. Love Kingston is an organisation that draws together five separate local charities under one banner — Kingston Churches Action on Homelessness, the Oxygen youth project, Kingston Food Bank, Hestia Women's Refuge, and Kingston Savers credit union. Each of these charities does amazing, life-changing work in our community, but like many small non-profits, are struggling to secure the funds they so desperately need to do their work. One of the key aspects of Love Kingston is the creation of a legacy fund that will grow over time and ensure a source of funds into the future. A portion of all donations made are added to the legacy fund, and supplemented by an additional contribution equal to 50% from Community First. The Kingston Legacy Fund is an endowed fund, and the income is used to support Kingston charities year-on-year. 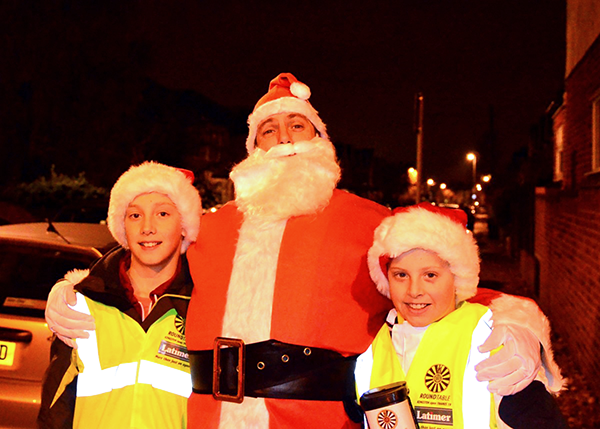 Because of the Community First contribution, our Carol Wagon funds will be boosted to a staggering £3125. It sets a high bar for next year! 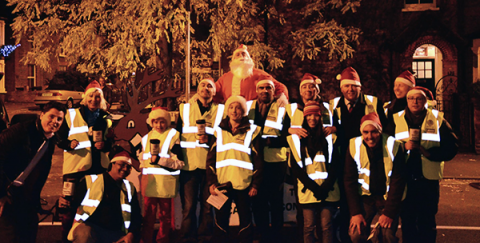 The success of this year's Carol Wagon wouldn't have been possible without the help of many other organisations and non-tablers. Amongst them we'd like to thank members of Kingston Rotary and Kingston 41 Club who gave up their time to swell our ranks. Also Elaine Miller of Love Kingston, who roped in a few of her friends, her two sons Jamie and Chad (pictured above with Santa), and representatives of some of the LK charities. A very big thanks must also go to the lads at Halfords, New Malden (pictured below) who generously gave of their time to make sure the Wagon was in roadworthy shape and didn't result in Rudolph getting a ticket!